Meet CentiMark’s Northern Group Sales and Marketing Manager, Gary Moore. Gary began working as a roofer with CentiMark during the summers of 1998 and 1999 while attending Miami University in Oxford, OH. Over the past 11 years, he worked as an Estimator in Dayton from 2003-2005, Project Manager in Dayton 2005-2006, Senior Project Manager in Louisville 2007-2009, Senior Project Manager in Columbus 2010-2011 and then on to his present role. Currently, Gary manages all sales and marketing efforts in CentiMark’s Northern Group. 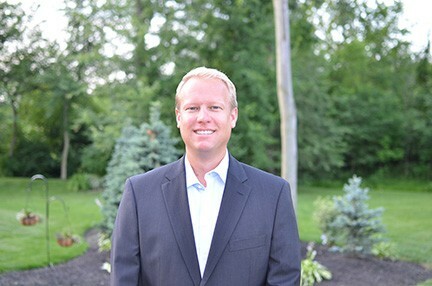 He is based in Columbus, OH but travels with 17 project managers to help them maximize sales and marketing initiatives within their territories. In addition, he helps hire and train estimators and regional marketers to help build them to be our next salesman. Gary’s vast knowledge of roofing and sales and his professional and personable nature have contributed to his success at CentiMark. An avid outdoors enthusiast, Gary enjoys fishing, camping and hiking. He has been a season ticket holder of the Cincinnati Bengals and Cincinnati Reds for a number of years and will attend almost any event that involves a ticket. Anywhere relaxing around the Caribbean Ocean is among his favorite vacation spots. Gary is married to his Miami University sweetheart, Heidi Moore, with whom he shares a beautiful five year old daughter, Calla. When I began my current role as Northern Group Sales and Marketing Manager, I never knew I would need someone to lean on as much as I rely on Terri Tucker. Terri has become the go-to person for our marketing programs within the Northern Group. Outstanding is an excellent word to use when describing her work ethic and follow up skills. Terri joined CentiMark three years ago. She had already proven herself working in marketing departments in the insurance, commercial real estate, optical and food equipment manufacturing industries. She quickly learned the multitude of services and products that CentiMark has to offer. She utilized her marketing skills to highlight CentiMark’s services in print, online and through e-mail campaigns. Terri is a trade show pro. She has been able to navigate the ins and outs of each tradeshow, manage promotional materials and track the success of each show for the entire company. Terri is committed to giving back to others in the community and this directly reflects the core values of CentiMark. Not only is she the first person in the office to coordinate CentiMark charitable efforts, but she is also heavily involved in volunteering for her church, her children’s school and in our community. Outside of work and volunteering, Terri spends her time camping, hiking and enjoying family and friends. Terri is married to Henry Tucker and they have two boys: Tyler (9) and Noah (3). One of her main passions is a love and caring for animals. I have not been able to figure out what she loves most: animals, The Ohio State University Buckeyes or the Cleveland Browns?